Folks who listened to our last podcast episode will know that Ani-Gamers was unfortunately not approved for any interviews at Otakon 2009. 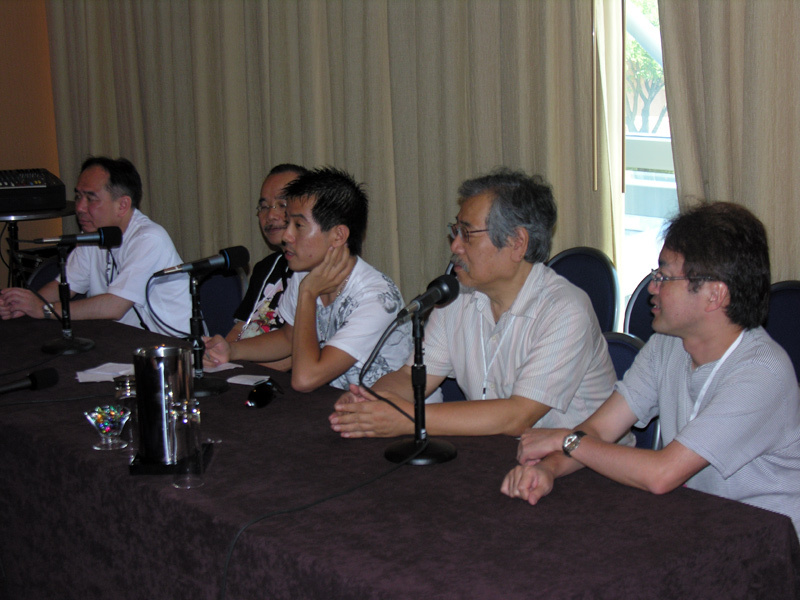 So, to make up for this situation, Evan attended a group press conference held by Otakon Press Ops, with guests Noboru Ishiguro, Masao Maruyama, Yukio Kikukawa, and Hidenori Matsubara. The "press conference" part means that, unlike an interview, this meeting entailed a variety of news outlets taking turns asking questions of the guests. Keep an ear out for Evan at the press conference, and enjoy the show! Show notes (including summaries of each guest's body of work) and links can be found after the break. [0:00:21] Evan provides some background info about the recording for listeners, including brief descriptions of the careers of each guest at the press conference, who are Noboru Ishiguro (director: Space Battleship Yamato, Macross, Legend of the Galactic Heroes), Masao Maruyama (founder/producer at Madhouse), Yukio Kikukawa (producer: Legend of the Galactic Heroes), Hidenori Matsubara (character designer: Ah! My Goddess, Gankustuou; animation director: Rebuild of Evangelion). [0:03:45] The press conference proper gets started with a question from Anime World Order's Gerald, and the rest of the folks in the audience quickly launch into questions of their own. The conference topics range from very specific (Ishiguro's reasons for naming a city in Orguss "Atlanta") to very general (the difficulties in creating an anime studio). Other than the previously-mentioned AWO, the outlets present at the press conference included the Advanced Media Network, Ogiue Maniax, and the Reverse Thieves. [1:01:15] Outro: This was the funny stuff that happened directly before we started the press conference, when we actually asked questions of the translator. Highlight: Carl (Ogiue Maniax) asks about "translation influences."